There was a slew of monthly and other data this past week. In the rear view mirror, Q1 GDP was revised down slightly from 2.2% to 1.9%. On the other hand, Q1 GDI, thought by many to be a more accurate measure, was reported at +2.6%. April personal income and spending both rose, and real income also rose. April construction spending also rose, and in particular private residential spending rose signifantly, adding to the evidence that the housing sector is rebounding. May consumer confidence from the Conference Board declined, as did May auto sales. The ISM manufacturing index turned slightly less positive, although new orders rose strongly. And then, of course, came the May payrolls report, which was about as awful as you could get and still generate a positive number. April was revised down. Manufacturing related parts of the index such as workweek and overtime also declined. The unemployment rate rose slightly. One slight positive was that temporary jobs increased slightly. Let's start by making a couple of points about this column. First of all, it is designed to be predictive but rather an up-to-the-moment report on the economy by use of high frequency weekly indicators. Secondly, while there is some randomness in each week's data, if there is a turning point in the economy, it should show up in these indicators first before it shows up in monthly indicators. So this week let's see if the high frequency data confirms that the awful employment report indicate a negative turn in the economy, or whether it is not supported by other data. The Mortgage Bankers' Association reported that the seasonally adjusted Purchase Index fell -1.8% from the prior week, and was down -3.9% YoY. The Refinance Index declined -1.5%. Despite the declines of the last few weeks, this index continues to be in the upper part of its 2 year generally flat range. The Federal Reserve Bank's weekly H8 report of real estate loans, which had been negative YoY for 4 years, turned positive two months ago. This week, real estate loans held at commercial banks declined -0.4% w/w, and their YoY comparison declined -0.6% to +1.0%. On a seasonally adjusted basis, these bottomed in September and remain up +1.5%. YoY weekly median asking house prices from 54 metropolitan areas at Housing Tracker were up + 2.0% from a year ago. YoY asking prices have been positive for the last 6 months, are higher than at any point last year, and we are now at the point where seasonally they are at their maximum. For months I've been saying that either this index had to turn or the Case-Shiller repeat sales index had to turn. With Case-Shiller now up two months in a row on a seasonally adjusted basis, I'm going to stick a fork in it. The Housing Tracker index proved its worth and did exactly what I said it was going to do, which is lead the other indexes. Barring the appearance of the long-delayed foreclosure tsunami (which, per Calculated Risk, may only occur in judicial states and be counterbalanced by the winding down of foreclosures in non-judicial states, which never had any delays), the bottom in prices is here. The Department of Labor reported that Initial jobless claims rose 13,000 to 383,000 last week. The four week average stands at 374,500. This renews the question of whether there is a seasonal adjustment issue or whether something more ominous is going on. The Daily Treasury Statement for the all of May showed $143.0 Bvs. $140.1B for May 2011. For the last 20 reporting days, $119.9 B was collected vs. $117.0 B a year ago, an increase of $2.9 B, or +2.5%. The year over year comparisons in this series have weakened significantly in the last several months, although generally they continue to be weakly positive. The American Staffing Association Index rose to 94. It has now surpassed 2007 and is only two points below its all time record from 2006 for this week of the year. Same Store Sales continue to be solidly positive. The ICSC reported that same store sales for the week ending May 19 fell -0.5% w/w, but were up +2.9% YoY. Johnson Redbook reported a 3.2% YoY gain. Shoppertrak reported a gain of 1.8% YoY. The 14 day average of Gallup daily consumer spending was very positive again this week at $76 vs. $68 in the equivalent period last year. M1 fell -0.7% last week, and also fell -0.1% month over month. Its YoY level increased to +16.5%, so Real M1 is up 14.2%. YoY. M2 rose +0.1% for the week, and was up +0.5% month over month. Its YoY advance rose slightly to +9.6%, so Real M2 increased to +7.3%. Real money supply indicators continue to be strong positives on a YoY basis, although they have had a far more subdued advance since September of last year. Weekly BAA commercial bond rates reported weekly last Monday rose .11% to 5.09%. 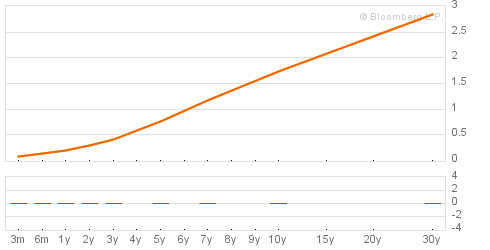 Yields on 10 year treasury bonds rose .02% to 1.76%. The credit spread between the two incresed again to 3.33%. The trend remains of strongly falling bond yields, which means that fear of deflation is strong. Spreads are now close to their 52 week maximum. Rail traffic turned more positive this week. The American Association of Railroads reported a +2.6% increase in total traffic YoY, or +13,700 cars. Non-intermodal traffic turned positive YoY, and was up by +3700 cars, or +1.3% YoY. Excluding coal, this traffic was up +11,300 cars. Ethanol-related grain shipments remained off, as were chemicals. Intermodal traffic was up 10,00 carloads, or +4.3%. Gasoline prices fell for the sixth straight week, down another .04 to $3.67. Oil fell again this week to end at $83.23. Oil has only been less expensive for about 1 in the last 12 months. Oil prices are now well below the point where they can be expected to exert a constricting influence on the economy. Since gasoline prices follow with a lag, we can expect gasoline to fall to that point in about a month as well. The 4 week average of Gasoline usage, at 8850 M gallons vs. 9083 M a year ago, was off -2.6%. For the week, 8931 M gallons were used vs. 9431 M a year ago, for a decline of -5.3%. Although this week was off, generally gasoline usage is moving to parity with the reduced levels that began to be established one year ago. 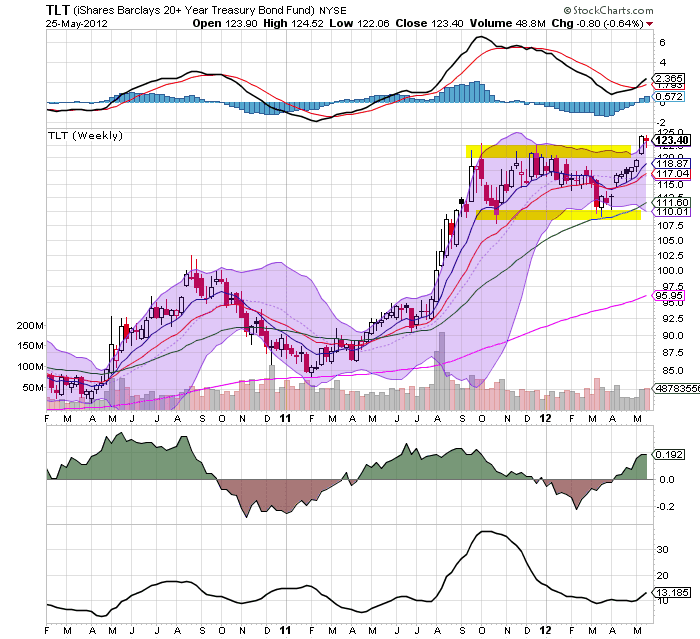 The TED spread rose 0.1 to 0.40, near the bottom of its recent 3 month range. This index remains slightly below its 2010 peak. The one month LIBOR rose 0.001 to 0.240. It is well below its 12 month peak set 3 months ago, remains below its 2010 peak, and has returned to its typical background reading of the last 3 years. It is interesting that neither of these two measures of fear have budged even slightly with the Europanic of the last month. The Baltic Dry Index fell for the second week in a row, down from 1034 to 904. It remains 234 points above its February 52 week low of 670. The Harpex Shipping Index rose another 2 points from 457 to 459 in the last week, and is up 84 from its February low of 375. Finally, the JoC ECRI industrial commodities index continued to slide this week, down from 119.64 to 117.74. This is very close to its 52 week low. This indicator appears to have more value as a measure of the global economy as a whole than the US economy. 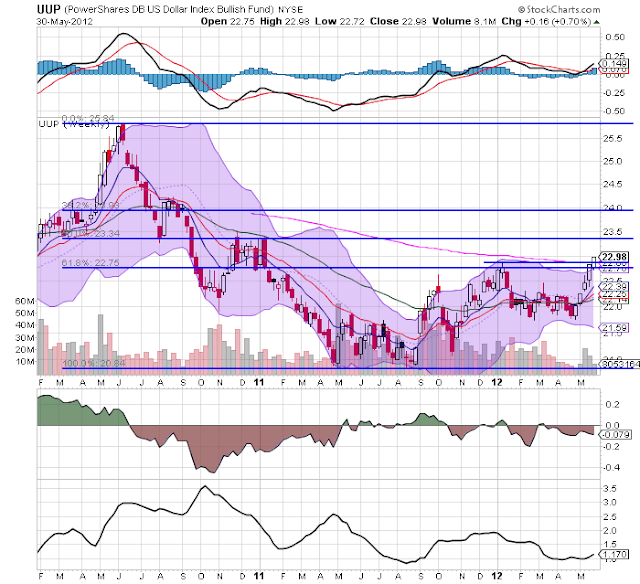 There are certainly pockets of weakness in the weekly indicators, including commodity prices, the Baltic Dry Index, credit spreads, and initial jobless claims. Most of these appear to be related to global vs. US weakness. Nevertheless the dominant theme of the US-centric high frequency data is continued positivity, including cheaper gas, continued consumer spending, and at very least stability in housing. Hiring has certainly slowed, perhaps related to exports. Auto sales also disappointed. But with new orders for manufacturing increasing and consumer spending continuing, at least as an initial impression the employment report looks more like a reflection of the present rather than a portent of the future. Well -- this week was terrible. To brighten things up, here is a video of the Muppets doing Bohemian Rhapsody. I'll be back on Monday. 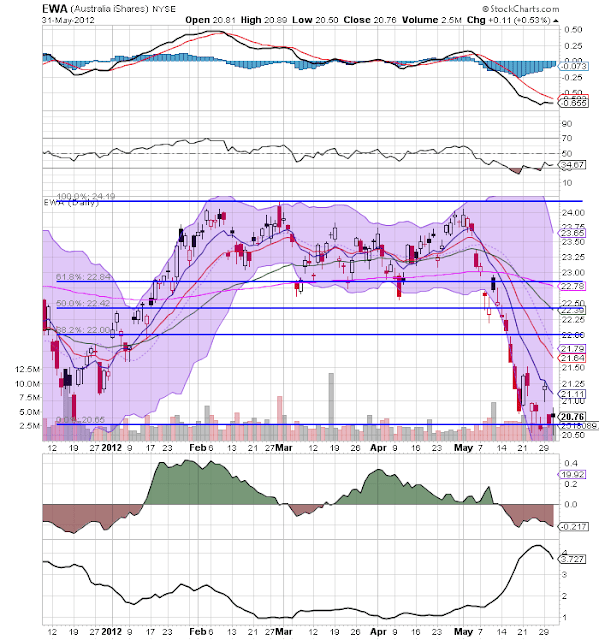 NDD will have the indicators tomorrow. Have a safe weekend. The chart above is from the latest employment report. Last year in the Spring, it looked as though we were getting escape velocity. Then we were hit by Japan's problems, high oil and EU. This year, we have just the EU, which is more than enough trouble. 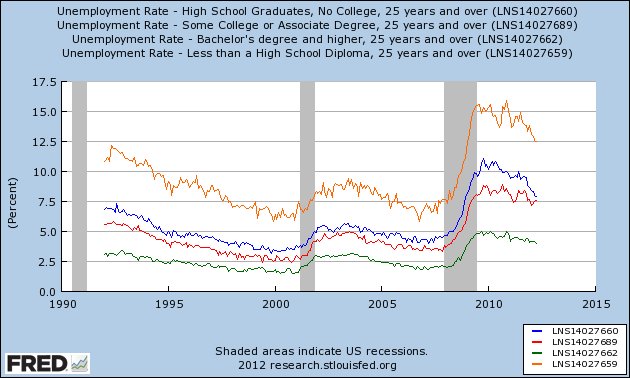 Also note the declining nature of the overall employment situation. As NDD noted, there is a ton of data out today. In addition, over the last week, we've seen some really terrible statistics come out of the BRIC's and other economies. This is a post that will keep track of the data as it comes out. First, before we get to the US report, consider these data points from the developing world. India's GDP slows to 5.3%. Yes, this is still far higher than the US'. However, with over a billion people, India has to keep a break neck pace of growth alive simply to keep up with population growth. This number is too low to allow that to happen. Yesterday's linkfest has links to three articles on India from Economonitor that provide a really good comprehensive overview of what is happening there. US GDP was revised down from 2.2% to 1.9% yesterday. While we're still growing, we certainly aren't making any records. China's factory output is weakening. Brazil lowered it's interest rates by 50BP on Wednesday, largely because it's growth is coming in just above 1%. 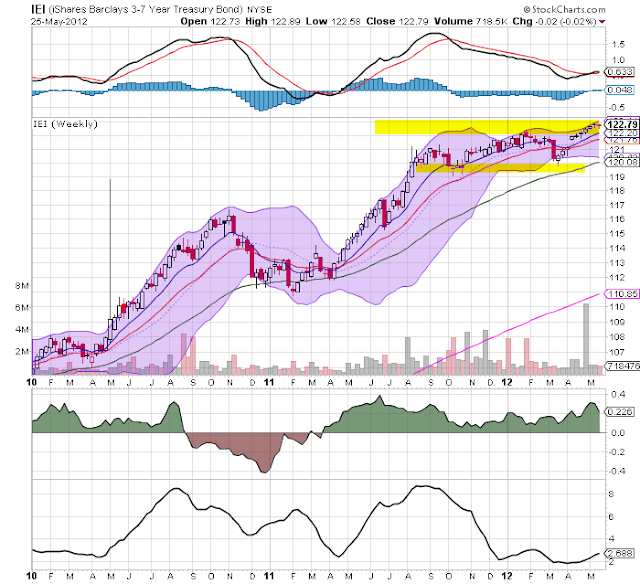 In short, the BRIC's are slowing down sharply. Here's the essential issue: China has powered its growth by becoming the manufacturing center of the world. This has fueled the growth of material exporting countries such as Brazil and Australia. Now China is looking to move away from that model to one more centered on consumer spending. That will have negative impacts on the previously listed countries. US employment report BLOWS: +69,000 with an unchanged unemployment rate. - (4) some of the weakness is seasonally adjusted construction employment, which rose 43,000 during the winter (seasonally adjusted) and has now given it back. This is probably an anomoly due to the non-winter winter. March and April were revised down. April now shows only 77,000 jobs added. This is what I would expect to happen heading into a recession. The manufacturing workweek, a leading indicator, declined 0.3 hours. The number of people unemployed for 0 to 5 weeks rose again, by 37,000. This is a more timely leading indicator than initial claims. The unemployment rate rose 0.1% to 8.2%. The broad U-6 unemployment rate rose from 14.5% to 14.8%. Aggregate hours worked was unchanged. This is a coincident indicator which may form part of the NBER's recession criteria. Average hourly income rose only 0.1%, or two cents, to $23.41. This is pathetic. In summary, the coincident parts of the report stunk, but were still positive. Most of the leading indicators in the report turned negative. This was a bad report. Okay, now that you are thoroughly depressed, let's briefly discuss the personal income and spending report, which was better. Real disposable personal income rose 0.2% in April. Spending rose 0.3%, and so the savings rate declined 0.1% to 3.4%. It looks like real personal income after transfer payments also rose. This is one of the four coincident indicators used by the NBER in making their recession calls. The good news is that the YoY decline in real income is abating, and could turn positive in a month or two. That would alleviate at least one worry. The ISM manufacturing index for May decreased slightly to 53.5, which still shows expansion. The new orders component, which has just been added to the LEI, increased to 60.1. This is an excellent number and in line with a strongly expanding economy for the last 30 years. Interestingly, the subindex taken out of the LEI, supplier deliveries and the backlog of orders, actually contracted. Mixed, but almost all positive in various degrees. Next, construction spending for April. This increased 0.3% from March, which was revised higher from +0.1% to 0.3%. Overall private construction rose 1.2% month over month, while public construction (thank you Austerians) shrank by -1.4%. Within private construction, nonresidential (e.g., office, warehouse, stores etc.) contracted slightly, down -0.2% month over month. But the star of the show was private residential construction, up 2.8% month over month. This is housing, folks. Here we are in 2012, and housing is the most improving sector of the economy. Hoocoodanode!!! A commenter recently noted that there is clearly a negative impact coming from the rest of the world, hitting the US. I completely agree with this sentiment. As I've noted for about the last month in the market analysis section, equity markets around the globe are dropping; safe assets are rallying (US, German and UK bonds, US dollar and Japanese yen), commodities are dropping. This is the exact scenario you would expect in a pre-recession trading environment. While I don't think we're in a recession yet, we are getting dangerously close. Auto sales came in at 13.8 million annualized. This is the lowest reading this calendar year, and mirrors the stall in auto sales that took place exactly one year ago. One year ago at least part of the reason was a parts shortage due to the earthquake and tsunami in Japan. There's no such excuse this year. Hopefully with gas prices falling, YoY consumer income will catch up and the profound weakness in some of the numbers we got today will pass. We'll continue to pick through the entrails in the coming week. After forcing us information geeks to twiddle our thumbs for the last few weeks, the government and private industry have decided that in the course of about 6 hours today, they are going to throw at us every single economic statistic they could get their hands on, including the kitchen sink (that would be construction spending for April). 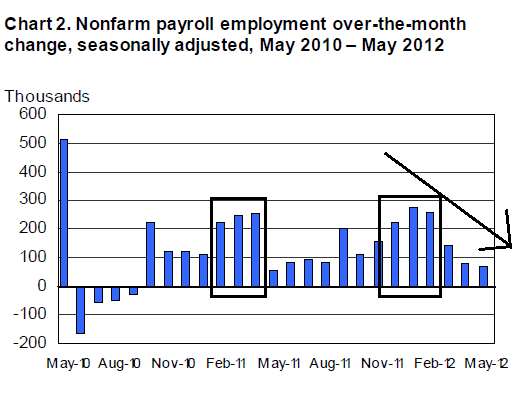 We also get April income and spending, the May ISM manufacturing report, auto sales, and of course the jobs report. Oh, yeah, and the European markets are taking a dive. My mantra will be "value added" so I'll update throughout the day to highlight some of the numbers that others are likely to overlook, especially the forward-looking statistics. The Australian market is trading near six month lows. 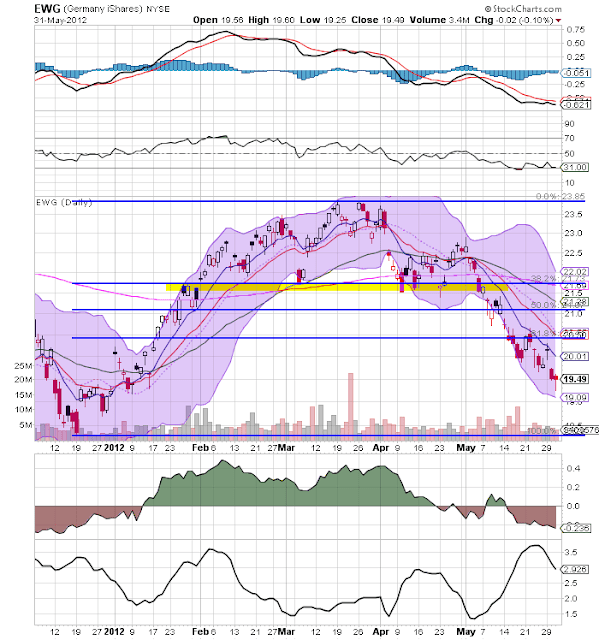 The MACD is declining, the CMF is weak and volatility is up. 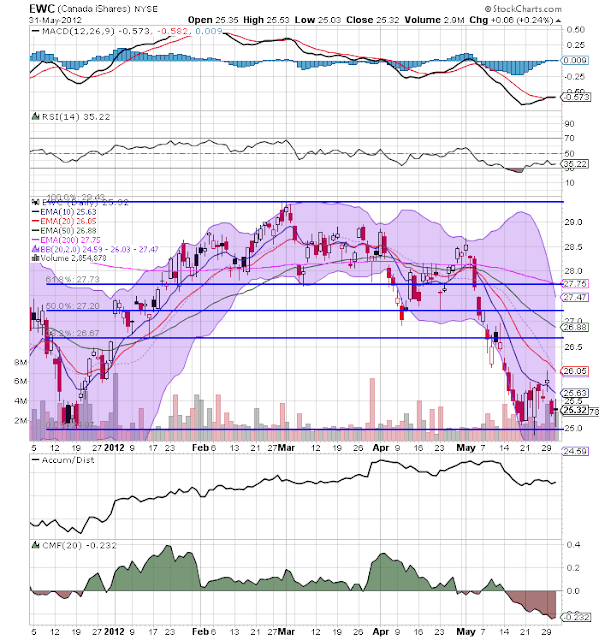 Also note the EMA position -- all the shorter EMAs are moving lower with the shorter below the longer. 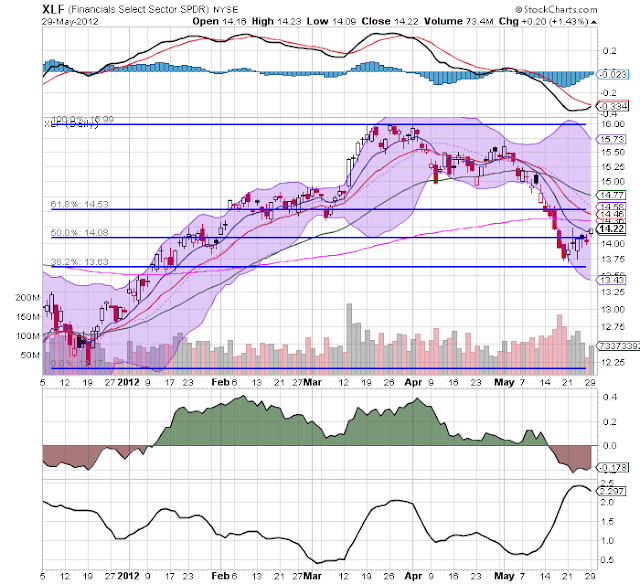 The South Korean market is trading at the 38.2% Fib level from the December to April rally. Like the Australian market, the underlying technicals are weak -- the MACD is declining, the RSI is weak, the CMF is negative and volatility is up. 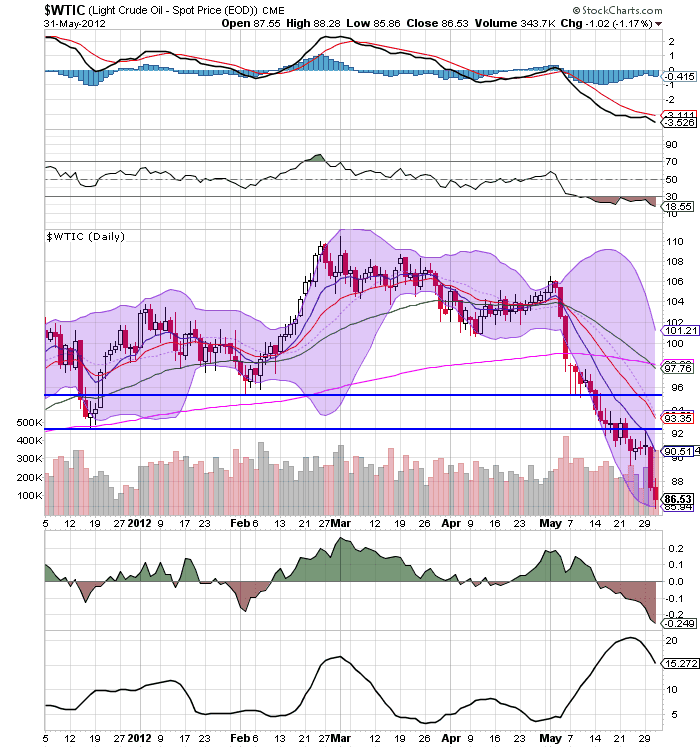 The Canadian market mirrors the Australian market -- prices are near 6 month lows, the underlying technicals are deteriorating and the shorter EMAs are dropping and bearishly aligned. The German market is right below the 38.2% line of the December to March rally. 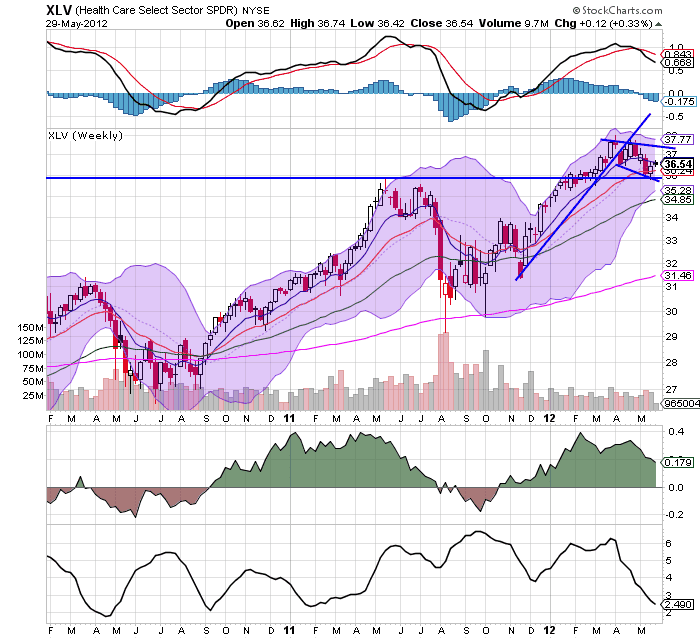 The underlying technicals are weak (declining MACD, weak, RSI and negative CMF). The above four equity markets are for some of the stronger economies on around. Yet, the equity markets are dropping, indicating overall weakness -- or at least perceived weakness. Industrial metals are also near 6-month lows. Momentum is dropping, volume is a net outflow and RSI is weak. However, overall volatility is lower than you'd expect for a declining market. Oil is now near six months lows, with all of the weak underlying technicals applicable to this situation. Linked by a common currency but not a common economy, the crisis-battered euro-zone nations are facing a pivotal choice: Either move more closely together or risk their currency union breaking apart. But are European voters — some in nations divided by centuries of rivalries — willing to take that leap toward closer integration? The fiercely independent Irish are about to offer a window into the answer. From the emerald hills of Donegal to the shores of Cork, the Irish go to the polls Thursday in a referendum on a regionwide fiscal treaty inked in January that would impose strict limits on budget deficits and debt. European governments that ratify the treaty will effectively surrender a measure of sovereignty over two of their most sacred economic rights — how much they can borrow and how much they can spend — to the bureaucrats in the region’s administrative capital of Brussels. The referendum, in many ways, is shaping up as a litmus test of the willingness of Europeans to more deeply link their economic fortunes. As the region’s crisis deepened, European Commission President Jose Manuel Barroso underscored the urgency on Wednesday, heightening calls for radical rule changes that would begin to make the 17 member nations of the euro zone act more and more like the 50 U.S. states. • If states had provided the same level of per capita support as in 1990-1991, they would have invested $80.7 billion in 2010-2011. • If states had provided the same level of funding per public, full-time equivalent student as in 1990-1991, total appropriations in 2009-2010 would have equaled approximately $102 billion, an amount 35.3 percent higher. • The proportion of their revenues that public colleges and universities received from state appropriations dropped from 38.3 percent in 1991-1992 to 24.4 percent in 2008-2009. Rising tuition, fees, and room and board represent a shift in support from the state as a whole to individual students and their families. In addition, the financial aid system has failed to keep pace with escalating costs, forcing students and their families to rely on financing strategies that reduce their odds of completing school. • States reoriented their financial aid programs away from need-based assistance to merit-based aid, which favors wealthier students. Students not only pay more than they used to but also borrow more extensively. The state school system used to provide a great, inexpensive way for students without means to obtain an affordable college education. But the lack of investment in these systems over the last 20 years has led to an increase in tuition costs. The IWMs are the worst off -- which is to be expected as they're the riskiest of the averages. However, prices are only down about 10% from their highs in late Market. Prices are under the 200 day EMA. They recently formed a relief rally, but hit resistance at the 20 day EMA. The most important level here is the 74.25 level; a move below that make the next logical price target a bit above 70. 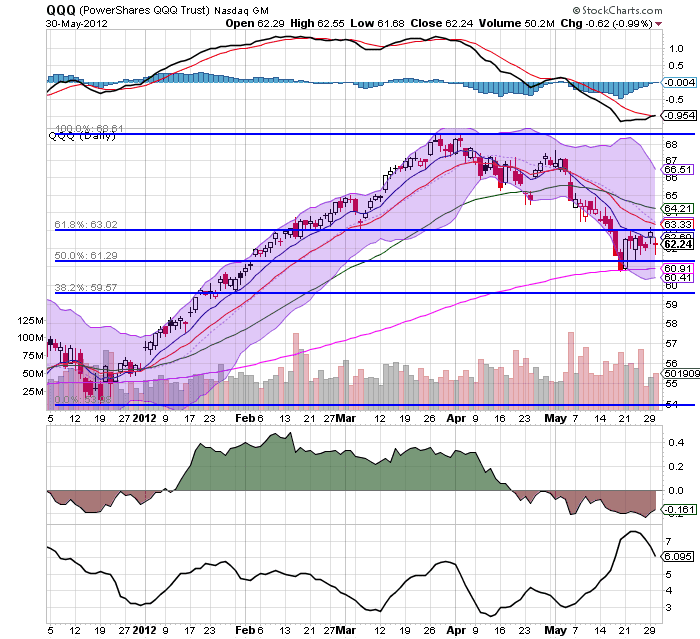 The QQQs found support at the 200 day EMA -- which was also just below the 50% Fib level. Right now the big technical support is to be found at the 200 day EMA; a move through that level would lead to the 59.50 level being the next logical level of support. Also note: the QQQs have only dropped about 10.5%. The SPYs are right above the 200 day EMA. Like the other averages, they rallied over the last week, only to drop yesterday. However, the SPYs have only dropped about 7.75% from their highs. But, like the QQQs and IWMs, we see a deteriorating technical situation: declining MACD, negative CMF and increased volatility. Two of the above averages have hit the "correction" level -- a drop of 10% or more. However, the SPYs are still lagging that drop. The dollar has moved through the 61.8% Fib level of the long, 2010-1012 sell-off. Prices have also moved through the highs established at the beginning of the year and the 200 week EMA. The dollar is benefiting from the safety trade as traders flee the euro. 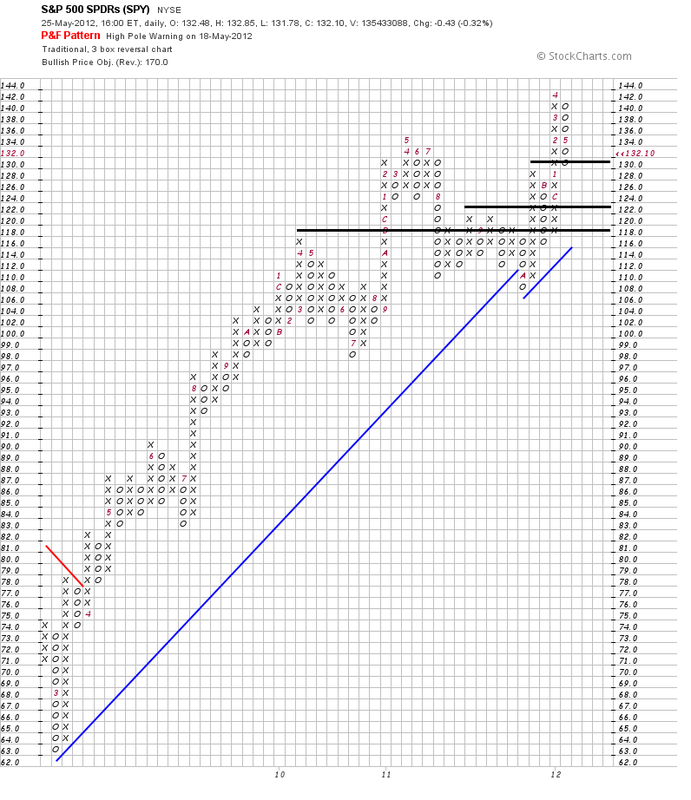 The next logical price target is right below the 23.5 level. "The college-for-all crusade has outlived its usefulness. Time to ditch it. Like the crusade to make all Americans homeowners, it’s now doing more harm than good. It looms as the largest mistake in educational policy since World War II, even though higher education’s expansion also ranks as one of America’s great postwar triumphs. MP: The chart above shows graphically the results of the "college-for-all crusade." In the 1970s and 1980s only about one out of three high school graduates went on to college. Now about half of all high school graduates attend college. And most of them now graduate with student loan debt of $25,000 and many are having a hard time finding a job. For reasons unknown, the US political right has a big problem with educating people. Whether it's the "threat of liberal indoctrination" (ever talked with professors in the business school ?) or some other such nonsense, the lack of respect for education and educational achievement is palpable -- and grows more and more every year. The more educational achievement you have, the lower your unemployment rate. And this is not a matter of .5% here and there, it's a noticeable difference. Over the last month or so, we've seen stories that the two big BRIC economies of India and China are slowing down. However, a fundamental question that we have not answered is this: why are the BRICs -- and more importantly India and China -- so important? The combined total of the Chinese and Indian population is about 2.5 billion. That comprises about 37% of the world's 6.8 billion population -- a very significant number. More importantly, that number is 66% of the population of the 10 largest economies in the world. In addition, from a purchasing power parity perspective, China is the third largest and India is the fourth largest economy in the world. A slowdown that effects this many people is bound to hurt. And, most importantly, there are no countries of comparable size to take the reins. 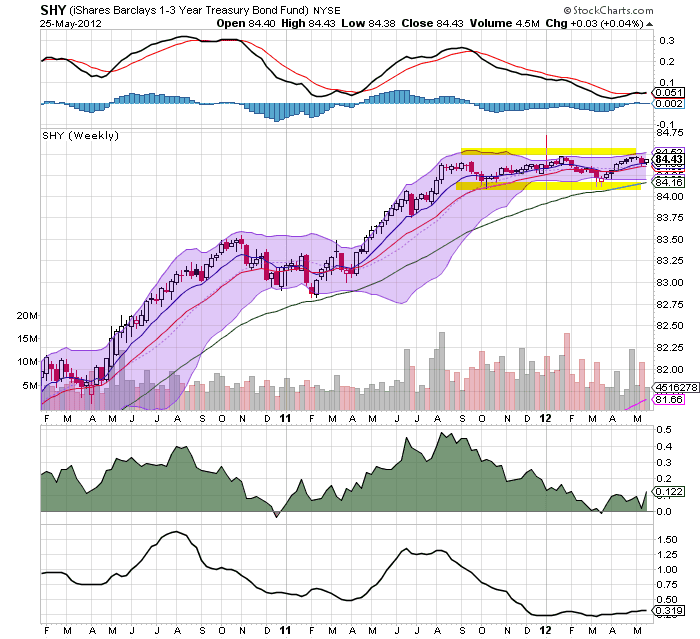 The technology sector is the largest sector of the SPY's accounting for a little under 20% of the average. Overall, this sector has dropped about 7.4%. 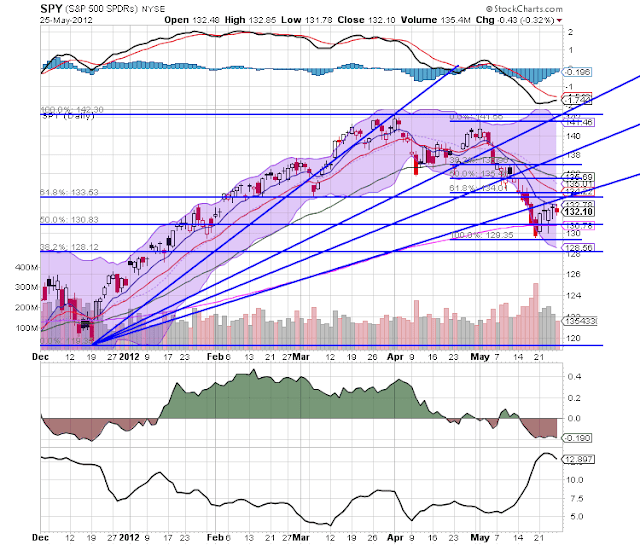 Prices are right about the 200 day EMA and are also being hemmed in by the 10 and 20 day EMA. Also note the declining momentum and CMF. The real issue with this chart is the 200 day EMA; so long as prices stay above/near that level, I don't see any major problems. 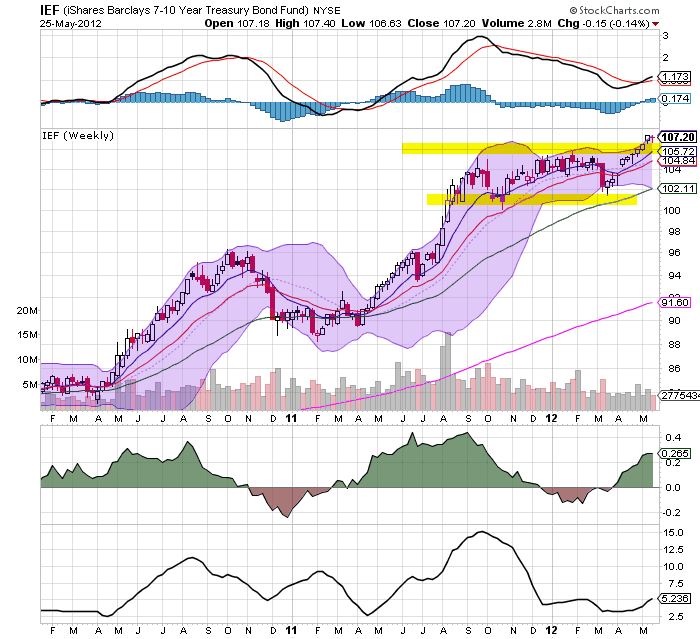 However, the weekly chart says the 26.75 price level is the most logical price target for this sector. 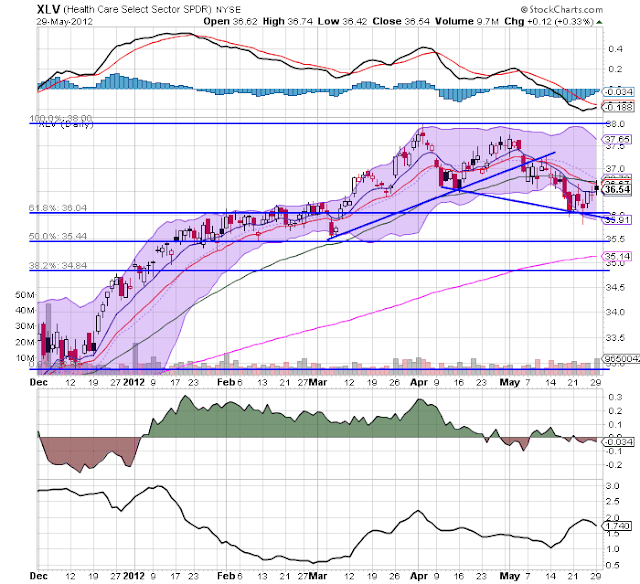 The XLFs (which comprise 14% of the SPYs) have broken through the 200 day EMA. Prices are currently in a rebound rally, but the deteriorating technicals (dropping MACD and CMF) tell us that the rally is purely technical. 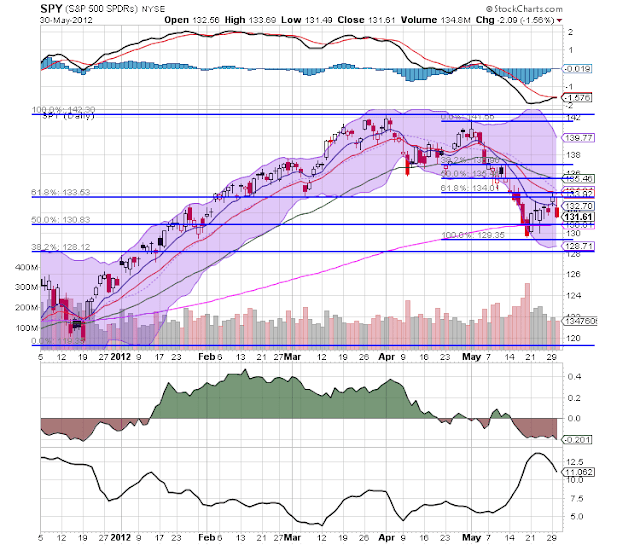 the 13.6 level (the 38.2% Fib level) is key; a move through that level would send the average lower. The weekly XLF chart is also deteriorating; the MACD has given a sell signal and the CMF is declining. 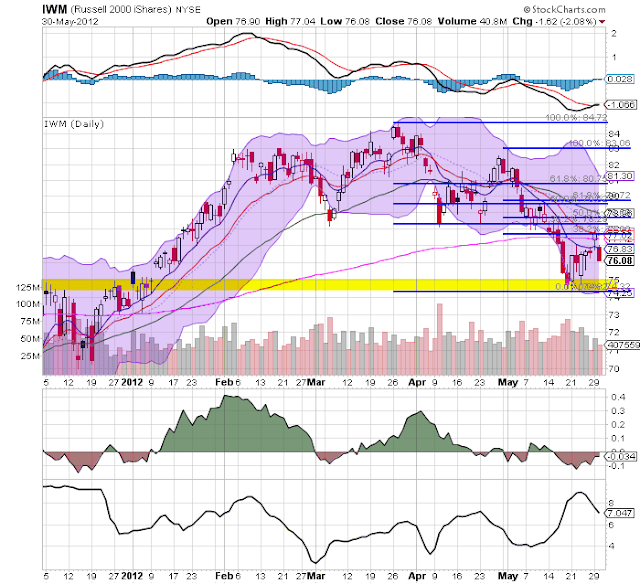 Prices rallied to the 200 week EMA, but were rebuffed. Prices are right at the 61.8% Fib level, but are contained by the 10, 20 and 50 week EMA. The XLV, which account for 11.8% of the SPYs, are in a slightly downward sloping channel. 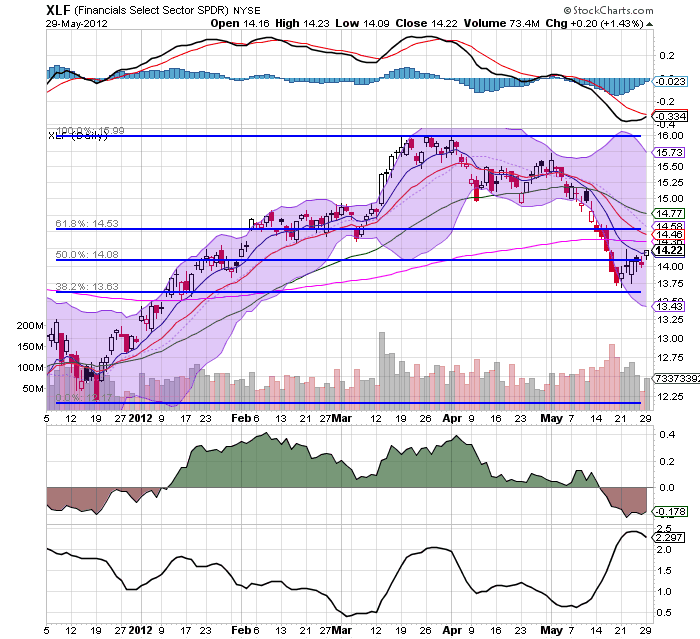 But they have found strong support at the 81.8% Fib level. The weekly chart shows that prices are at support levels established in mid-2011. 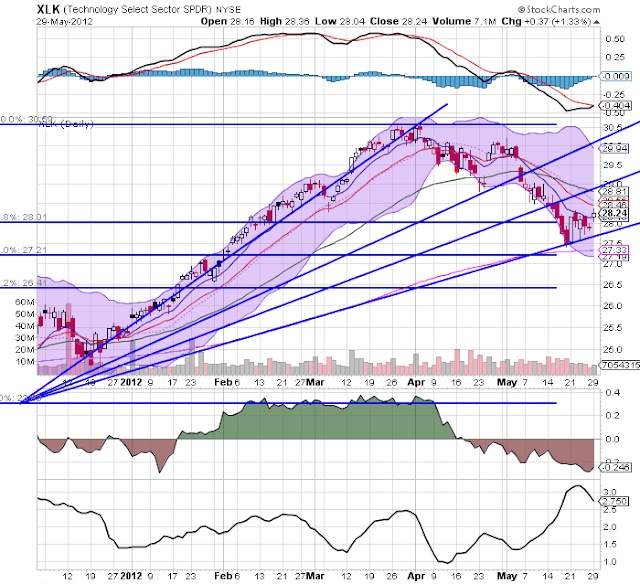 The two largest areas of the market -- technology and finance -- are clearly correcting. However, both have support on their respective weekly charts. 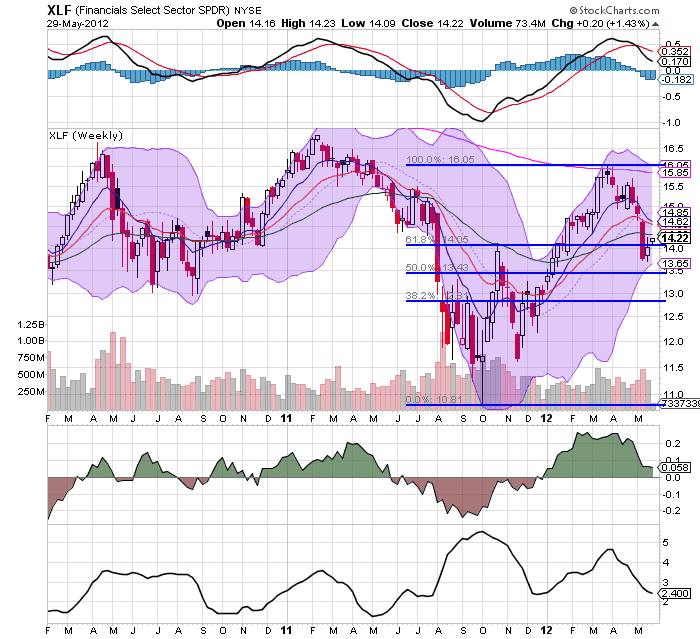 The health care sector is moving lower, but its movement could also be classified as a holding pattern. The checks are stopping for the people who have the most difficulty finding work: the long-term unemployed. More than five million people have been out of work for longer than half a year. Federal benefit extensions, which supplemented state funds for payments up to 99 weeks, were intended to tide over the unemployed until the job market improved. In February, when the program was set to expire, Congress renewed it, but also phased in a reduction of the number of weeks of extended aid and effectively made it more difficult for states to qualify for the maximum aid. Since then, the jobless in 23 states have lost up to five months’ worth of benefits. Next month, an additional 70,000 people will lose benefits earlier than they presumed, bringing the number of people cut off prematurely this year to close to half a million, according to the National Employment Law Project. That estimate does not include people who simply exhausted the weeks of benefits they were entitled to. Separate from the Congressional action, some states are making it harder to qualify for the first few months of benefits, which are covered by taxes on employers. Florida, where the jobless rate is 8.7 percent, has cut the number of weeks it will pay and changed its application procedures, with more than half of all applicants now being denied. So -- Who Is Really Spending More? There's been a pretty big debate about whether or not the administration is the most spendthrift administration in the world, universe, or galaxy. What started this off was an article by Rex Nutting over at Marketwatch titled, Obama Spending Binge Never Happened. After that, the predictable sources chimed in in predictable ways. So, let's do what we always do, which is look at the data. 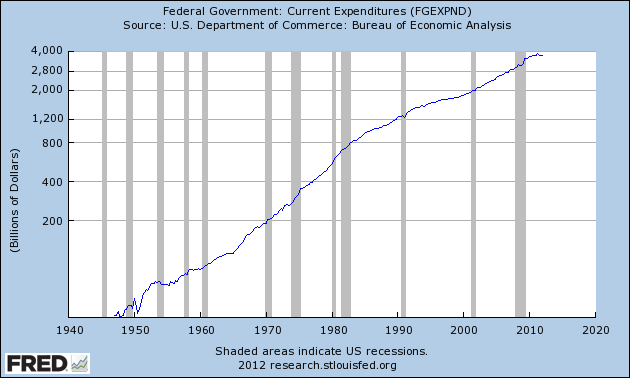 Above is a chart of federal government expenditures in logarithmic format. This data makes very clear that no one is immune to the charges of too much spending; instead we see that regardless of who is in power in the White House or Congress -- or whatever permutation/combination thereof -- spending increases. In actuality, this is to be expected. Government spending is a component of overall GDP; as GDP increases, government spending would also increase. Looking at the most recent data, we see a large bump from about $3.2 trillion to about $3.5 trillion at the beginning of fiscal 2010. This would have been the stimulus. However notice that after that big bump, there is a leveling out, especially over the last 8 quarters. Currently, we see spending at about the $3.7 trillion level, indicating an increase of about $200,000 billion over two years. This really isn't that much in a $15 trillion dollar economy. 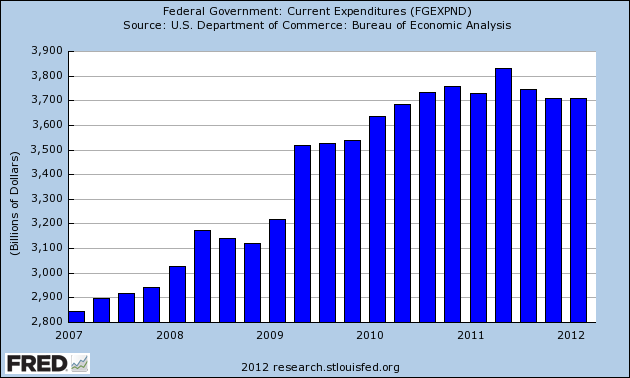 The above chart is a 5 year chart of total government expenditures, which shows the spending in a bit more detail. 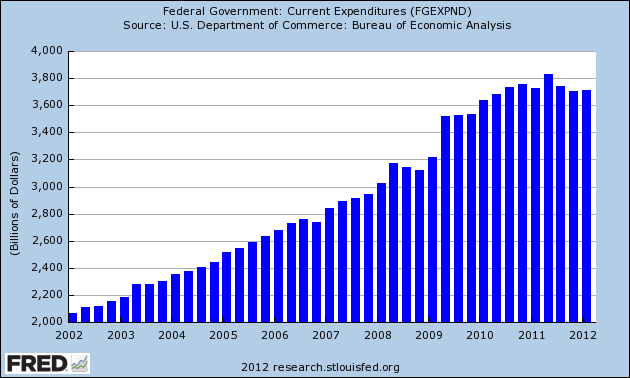 So, what we see is stimulus spending increasing total government spending. But then we see a leveling off of that spending after the stimulus was enacted. Let's look at a few more data points. The following charts from the data collected by the CBO on their historical data page. 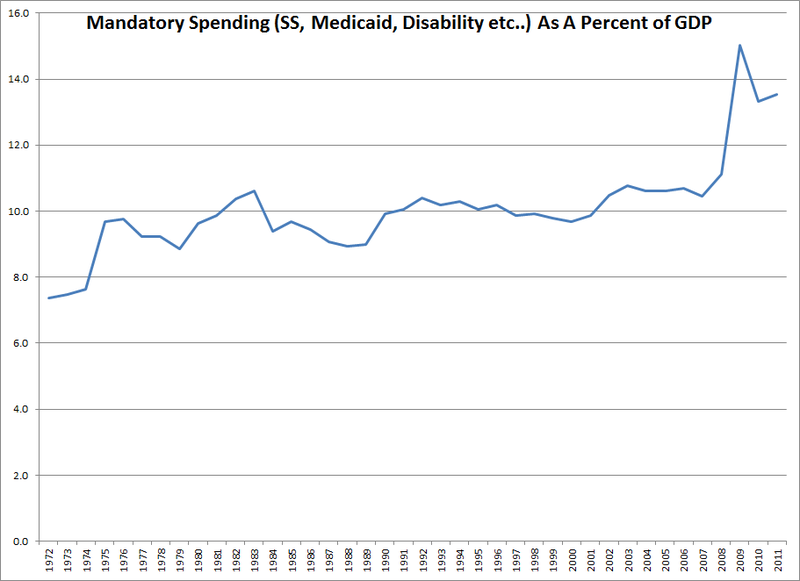 The above chart shows mandatory spending on basic programs such as SS, disability, medicaid, medicare etc... as a percentage of GDP. These were at 10.5% in 2007, 15% in 2009 and 13.5% in 2011. Part of this increase is due to "income security" expenses (read: unemployment insurance). These expenses increase from 1.8%/GDP in 2008 to 3%/GDP in 2010. 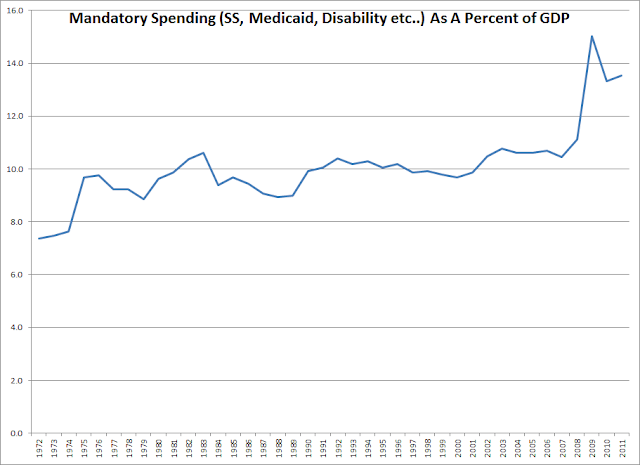 We also see an increase in medicaid spending of .5%/GDP from 2008-2011 and a bump of 2.6%/GDP in "other programs" in 2009. Put another way, a large reason for this increase is a widening of the social safety net as a result of the Great Recession. 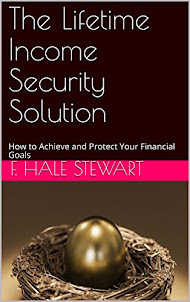 Also of consideration is the retiring of the baby boomers, which has led to increased payouts from Social Security. These increased from 4.2% of GDP in 2007 to 4.8% of GDP in 2011. 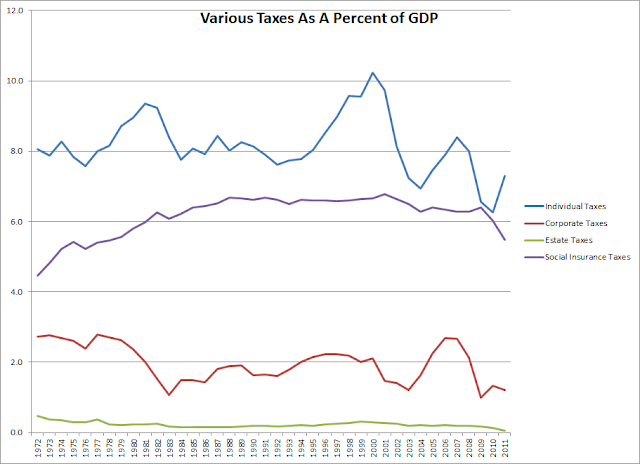 Above is a chart that shows tax revenue as a percentage of GDP for various taxes. This chart shows some very interesting data. 1.) The estate tax has been a minimal component of total tax revenue of the US government. 2.) Despite claims that the US corporate tax rate is one of the highest in the world (which is technically accurate, but in fact a gross oversimplification of the numerous ways corporations in fact pay no tax), tax revenue from corporations is near a 40 year low. 3.) Tax revenue from individuals -- despite claims that we're over-taxed and over-burdened in the current economy -- is in fact near a 40 year low. 3.) Social insurance taxes are actually near their lowest in many nearly 40 years. First, spending has increased. But it's the kind of spending you'd expect to see in a recession, where we increase spending for things like unemployment insurance and overall increased use and utilization of the social safety net. It's also important to remember that baby boomers are starting to retire, adding further demands on the social insurance expenditures. Second, this is as much an issue with low taxes. That is, raising taxes on individuals and closing loopholes for corporations would help to close the budget gap. And, please, spare me the "we can't tax job creators" lingo; the "job creators" already have a ton of money and they're not creating squat now. I haven't read any commentary by others on this morning's release of the Case-Shiller indexes. Unlike most others I focus on the seasonally adjusted numbers, since they will show a turn sooner. This morning both the 10 and 20 City indexes went up for the second month in a row. That is the first time there have been two monthly advances in a row since 2007, outside of the period of the $8000 housing credit which ended in April 2010. Fifteen of the 20 cities in the larger index showed increasing prices. Only 4 cities -- New York, Chicago, Detroit, and Atlanta -- declined to new lows. A fifth, Portland, decreased this month but was above its January low. Unless the much-anticipated foreclosure tsunami arrives (and waiting for it has approached the level of Waiting for Godot), it appears the turn in the market is here. 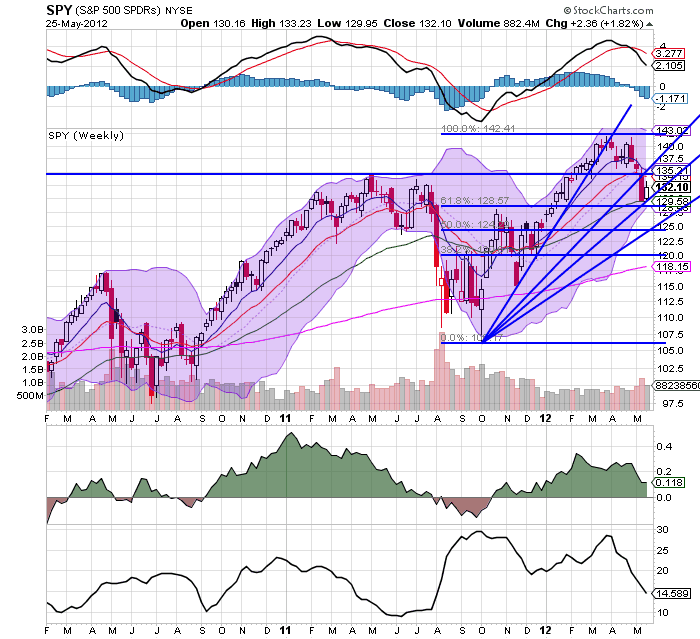 Let's start the holiday shortened week by looking at where we are in the market cycle. The weekly chart shows that prices have retreated from highs and are now at the 50 week EMA. We see several levels of technical support established by Fib fans and retracements between current prices and the 200 day EMA. 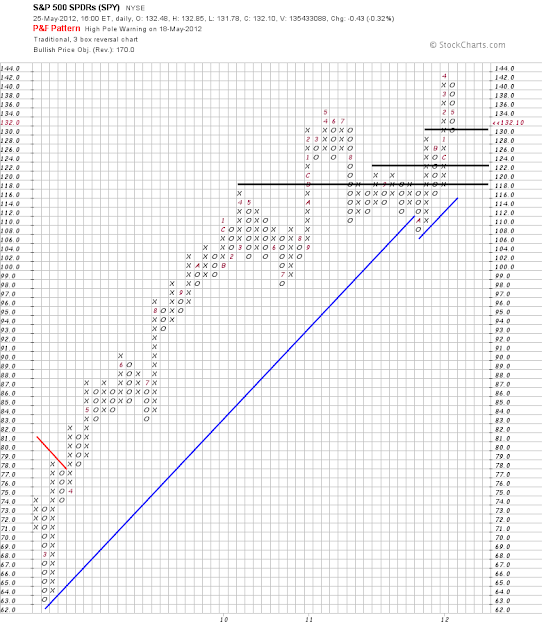 The P and F chart shows that the SPYs have price support at the 120 level -- quite a ways below current levels. The equity markets are clearly in a correction phase as shown on both the daily and weekly charts. While there are Fib levels on both charts, we don't see price support until the 120 level, which is cause for some concern. 30 year rates are now below 3% -- an incredibly low level. Basically, we're right back where we were last year at this time. 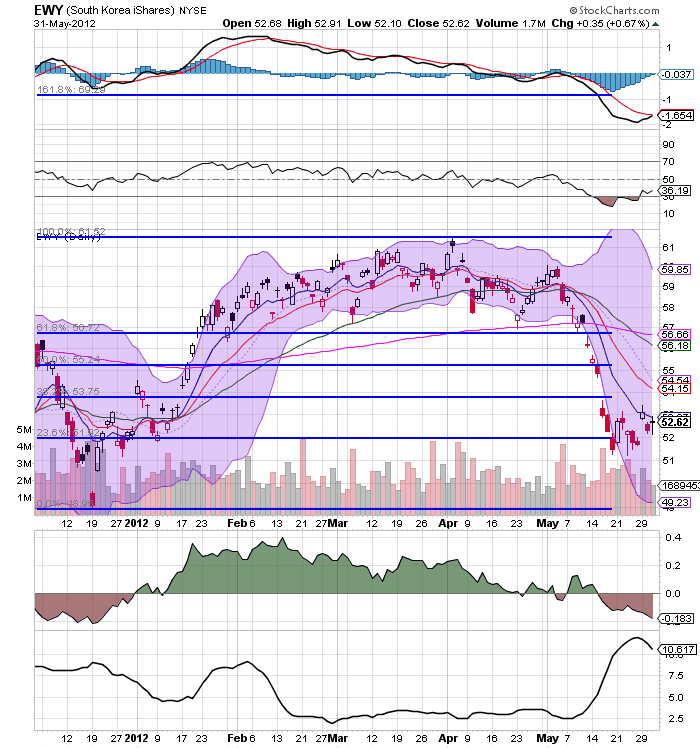 The EU has scared the hell out of the markets, sending equities lower and treasuries higher. The markets are closed today and so are we. I'll be barbequing some ribs and enjoying the first game of the Stanley Cup playoffs. There was little monthly data reported in this past week. New and existing housing sales both rose, as did several housing indexes, adding to the evidence that the recovery in housing sales is real, albeit from record low levels. Consumer confidence rose to the highest levels since before the great recession, including the expectations index which is a component of the Leading Indicators. The high frequency weekly indicators were mixed this week, but generally neutral to positive as the Oil choke collar continues to disengage. One indicator stands out as negative. Let's start again with the negative indicator. Rail traffic was mixed again this week. The American Association of Railroads reported a -1.6% decrease in total traffic YoY, or -8,400 cars. Non-intermodal traffic was down by -14,700 cars, or -5.0% YoY. Excluding coal, this traffic was up 11,400 cars. A total of 8 of 20 subgroups were negative, including ethanol-related grain shipments were also off, as were chemicals, metals, and scrap. Intermodal traffic was up 7,300 carloads, or +3.1%. The Mortgage Bankers' Association reported that the seasonally adjusted Purchase Index fell -3.0% from the prior week, and also fell -3.8% YoY. The Refinance Index jumped another +5.6% with record low mortgage rates. 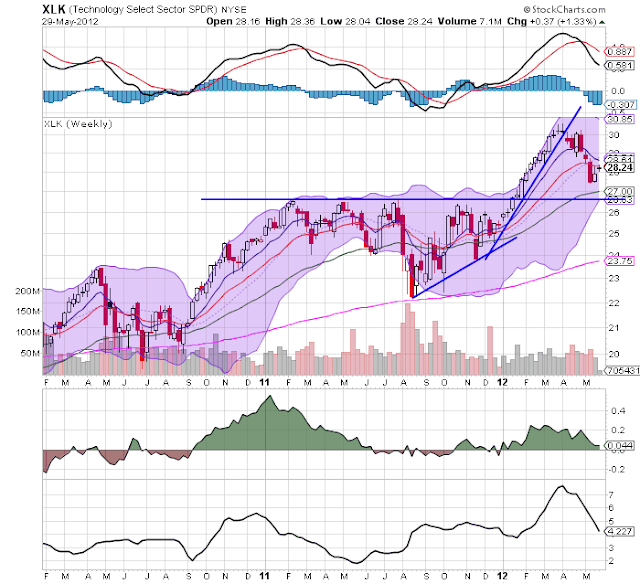 This index remains in the upper part of its 2 year generally flat range. The Federal Reserve Bank's weekly H8 report of real estate loans, which turned positive YoY for the first time in 4 years two months ago, rose 0.1% this week, and its YoY comparison rose +0.7% to +1.6%. On a seasonally adjusted basis, these bottomed in September and are up +1.7%. YoY weekly median asking house prices from 54 metropolitan areas at Housing Tracker were up +2.7% from a year ago. YoY asking prices have been positive now for 6 months, and median current list prices remain higher than at any point last year. The Case-Shiller repeat sales index for January-March will be reported this week and of course will be closely watched. The Department of Labor reported that Initial jobless claims remained the same at 370,000 last week. The four week average fell 5000 to 370,000. This measure has been essentially flat for 4 weeks after its April spike. The Daily Treasury Statement for the first 18 days of May showed $114.2 vs. $118.2B for May 2011. This has everything to do with the month starting on a Tuesday rather than a Monday. For the last 20 reporting days (4 x each day of the week), $133.7B was collected vs. $128.0B a year ago, an increase of $5.1B, or +4.0%. The American Staffing Association Index remained at 93 for the fourth week in a row. It remains two to three points below the all time records from 2006 and 2007 for this week of the year. It would have to remain flat or worse for another 2 to 3 weeks for me to be concerned at all about its trajectory. The ICSC reported that same store sales for the week ending May 19 fell -1.7% w/w, but were up +3.8% YoY. Johnson Redbook reported a 2.7% YoY gain. Shoppertrak did not report. The 14 day average of Gallup daily consumer spending was strongly positive at $74 vs. $65 in the equivalent period last year. The continued strength in consumer spending completely undercuts the meme that flat consumer income is dragging us back into recession. M1 rose +1.8% last week, and also rose +0.3% month over month. Its YoY level increased to +16.6%, so Real M1 is up 14.3%. YoY. M2 rose +0.1% for the week, and was up +0.3% month over month. Its YoY advance rose slightly to +9.6%, so Real M2 increased to +7.3%. Real money supply indicators continue to be strong positives on a YoY basis, although they have had a far more subdued advance since September of last year. Weekly BAA commercial bond yields fell -.10% to 4.98%. Yields on 10 year treasury bonds also fell even more, -.14% to 1.74%. The credit spread between the two remained even at 3.24%. Strongly falling bond yields mean that fear of deflation is strong. Spreads have been widening for the 6 weeks. Gasoline prices fell for the fifth straight week, down another .04 to $3.71. Oil fell slightly again this week, to $90.86. Oil prices are now below the point where they can be expected to exert a constricting influence on the economy. Since gasoline prices follow with a lag, we can expect gasoline to fall to that point in about a month as well. The 4 week average of Gasoline usage, at 8790 M gallons vs. 8961 M a year ago, was off -1.9%. For the week, 8633 M gallons were used vs. 9025 M a year ago, for a decline of -4.3%. Gasoline usage is generally moving towards parity with the reduced levels that began to be established one year ago. The TED spread remained at 0.390, near the bottom of its recent 3 month range. This index remains slightly below its 2010 peak. The one month LIBOR fell slightly to 0.239. It is well below its 12 month peak set 3 months ago, remains below its 2010 peak, and has returned to its typical background reading of the last 3 years. The Baltic Dry Index fell sharply from 1140 to 1034. The Harpex Shipping Index, on the other hand, rose from 445 to 457 in the last week, and is up 82 from its February low of 375. Finally, the JoC ECRI industrial commodities index fell again, from to 120.25 to 119.64. This indicator appears to have more value as a measure of the global economy as a whole than the US economy. 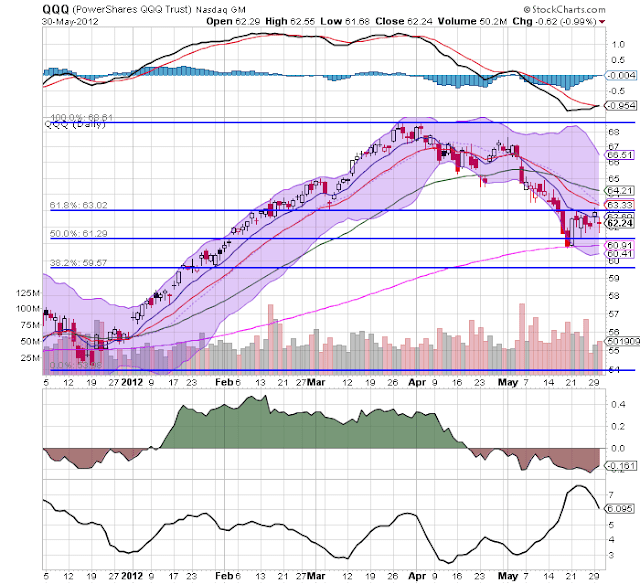 Due to global weakness, the Oil choke collar is loosening. Bond yields of all sorts are falling. Rail shipments are also signalling caution. Internal signs of the US economy generally remain positive, as they have all year. Several months ago, I identified consumer spending and gasoline usage as key areas to watch. They are holding up well. Aside from the big payrolls report next Friday, watch personal income to see if declining inflation helps alleviate the downturn in real income. Also, with the revision to 1st quarter GDP this week will come the report on Gross Domestic Income. Since there is evidence that GDP is revised in the direction of GDI over time, this will be an important landmark for the direction of the US economy.